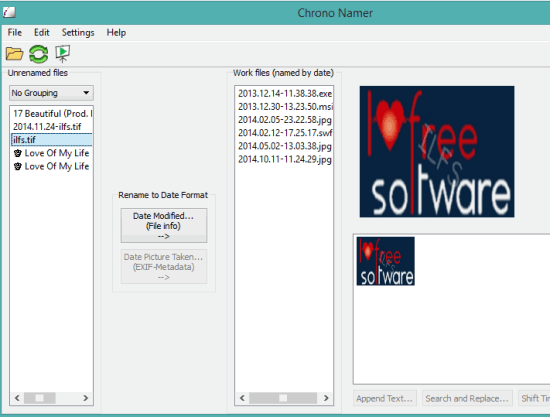 Chrono Namer is a freeware to batch rename files using the metadata of files. It automatically analysis all the input files by reading the metadata information, and checks for the date when those files were taken or created. After this, it provides a preview for output files containing the creation date and time as file name, and lets you rename your files. It is not limited to rename only images or audio files. You can rename any type of file, such as: audio video files, PDF, exe files, images, etc. Whole process to rename files is very quick. However, you can also rename output files manually. That means, once you have renamed the files, you can select those files to rename with available options. You can insert custom time value to the names of files, append text to file name, or just simply rename all the files one by one with custom text. In above screenshot, you can see the interface of this batch file renamer software. Middle part of its interface shows all the renamed files. Don’t forget to check these 20 free batch file renamer software covered by us. It shows preview for images on the right side of its interface. You can also play the slideshow of images using Help menu. 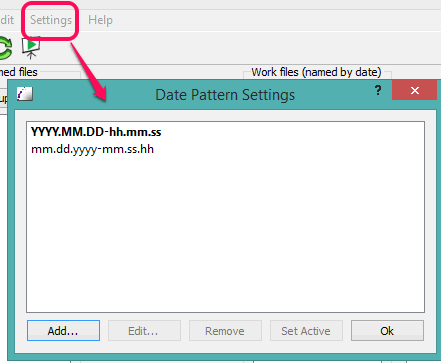 By default, date and time pattern for renaming the files comes as ‘YYYY.MM.DD-hh.mm.ss’. However, you can add more custom patterns using the Settings menu. How To Batch Rename Files using Metadata of Files with This Freeware? Download this software using the link added at the end of this review and install it on your PC. After this, you can open its interface to add files for renaming. You have to select a directory where all your files are available that you want to rename. After selecting the directory, list of all files will be visible to you on left section. From that list, you can select files for renaming. When you will select only images, then it will provide two options for renaming: Modified date and Picture Taken date. However, when you will select multiple files of different extensions, then only first option will enable. Now tap on Modified date button and it will show the preview for the names of output files. 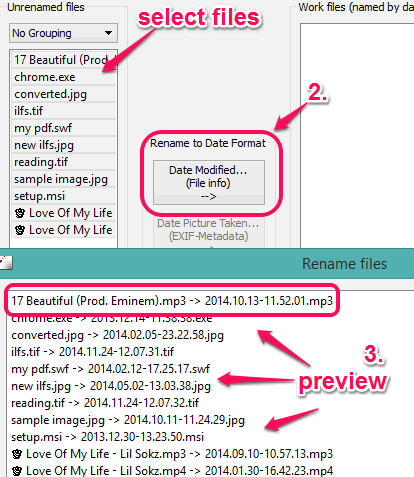 You can see that file name will be replaced with creation date and time of the file. To rename files, click on OK button. List of all renamed files will be visible on the middle part of its interface. You can also check the source folder to see if files are renamed or not. This is a very interesting feature of this software that helps to rename those files that you have renamed already. 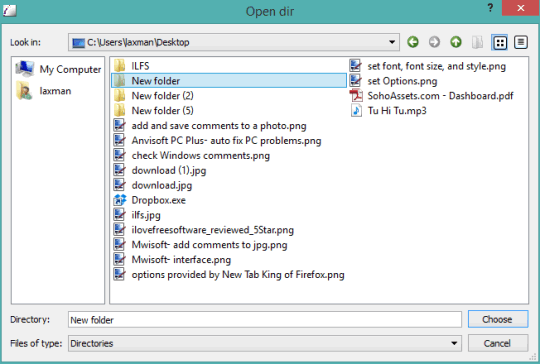 Select renamed files, like visible in the screenshot below. After this, multiple options will be activated: Append Text, Search and Replace, and Shift Time Name. 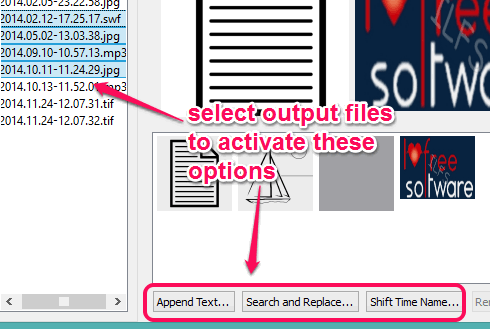 Append Text: Use this option to insert more text after the names of files. Search and Replace: As the name suggests, you can use this option to replace a common text/character present in all files, and replace it with desired text. Shift Time Name: This option is useful to change the time value in files names. Chrono Namer provides a lot of options for renaming the files. Its best part is that you can automatically bulk rename files with creation date and time of files.